Home flour	How to make pasta like a nonna! The other day I gave a lesson on how to make fresh pasta and I suddenly realized that I’d never written about how to make it on the blog. So this post is designed to put that right. I must confess that I didn’t learn how to make fresh pasta from my ‘nonna’, Zia Rita. She was lucky enough to live opposite a pastificio—a fresh pasta shop—so I never saw her make it. However, I did learn how to make it by watching my aunt, Zia Teresa, who I used to spend the summers with in Piemonte, when I was a teenager. I’ve never seen anyone work quite so hard around the house than Zia Teresa. She was a casalinga, or housewife, who was incredibly house proud and I rarely saw her take a rest. She lived with her husband, my uncle Zio Paolo, her daughter, my cousin Cinzia, and her mother known as la nonna Caterina, in a small village just outside the town of Alessandria. Every morning, after having packed everyone off to work or school, she would clear the breakfast things away and start to make lunch. This often consisted of slow cooked, soup or ragùs which were often as not accompanied by fresh pasta. She didn’t make fresh pasta every day, since Italians would never dream of eating it every day—controversial I know, but I’ll explain below—but she’d make it two or three times a week as I recall. She had an amazing system of staggering the cooking with the cleaning and other housework, all the bedrooms, the living room and bathroom getting a daily treatment. She also managed to fit shopping time in, although a lot of the fresh produce came from the orto or allotment at the back of the house, lovingly tended by the nonna Caterina. I remember her proffering me fresh tomatoes, as big as apples and to be eaten in the same way, which she called tomatiche in her dialect, rather than the standard Italian pomdori. The amazing thing was that lunch was always ready as soon as everyone returned home from school or work and that Zia Teresa would clear everything away and have the kitchen spotless before finally retiring for a pisolino, which is the Italian word for siesta. The recipe for fresh pasta (known in Italy as pasta all’uovo or egg pasta) is incredibly simple and easy to remember. For every person you are feeding you will need 100g of 00 flour (just over 3/4 of a cup) and 1 large egg. In Italy you can buy eggs specially produced for pasta that have incredibly yellow yolks. This is achieved through a process of rearing the chickens naturally and also feeding them with corn. The resulting pasta is a beautiful yellow color. If you make pasta with ordinary eggs it can end up being a bit white, but in that case you can use 1 whole egg and two egg yolks for every 200g of flour, which works very well. The nonna method for making pasta is to put the flour on a wooden board, and make a hole in the middle. You then put the eggs in the hole and beat them with a fork, gradually pulling the flour in from around the sides until it’s all been incorporated and then, and only then, bringing it together with your hands. This has the advantage of keeping your hands clean and also making sure that no egg or flour gets lost from the recipe during the process. 4. Bring the dough together with your hands. Once a dough has been formed, it’s kneaded and then rested, before being rolled out and made into the required shapes. Most nonnas would do the rolling out with a rolling pin, but many people now prefer a pasta machine. And that’s pretty much it. Sounds simple, but it’s actually quite easy to get wrong and for your pasta to turn into a soggy mess when you cook it. Which is where the secrets I learnt from Zia Teresa come in and which I will now share with you. 7. Roll the dough out before shaping it. Try not to touch the dough with your hands until all the egg has been incorporated. Knead the dough for at least 15 minutes until it looks smooth and is the consistency of plasticine. It should start making slight sighing noises as you knead it once it’s ready. When you press a finger into the dough, it should bounce back. Once ready, the dough needs to rest for at least thirty minutes. To do this, wrap it in clingfilm and put it in the fridge. Try pressing your finger gently into the dough again. If the hole holds its shape, it’s rested enough. If it springs back like before, it’s not ready and needs to rest some more. When rolling the dough out, do not use 00 flour to stop it sticking. Instead use durum wheat flour. This will not get absorbed into the dough but will coat it and stop it sticking. It also helps to stop the shapes sticking together before cooking. 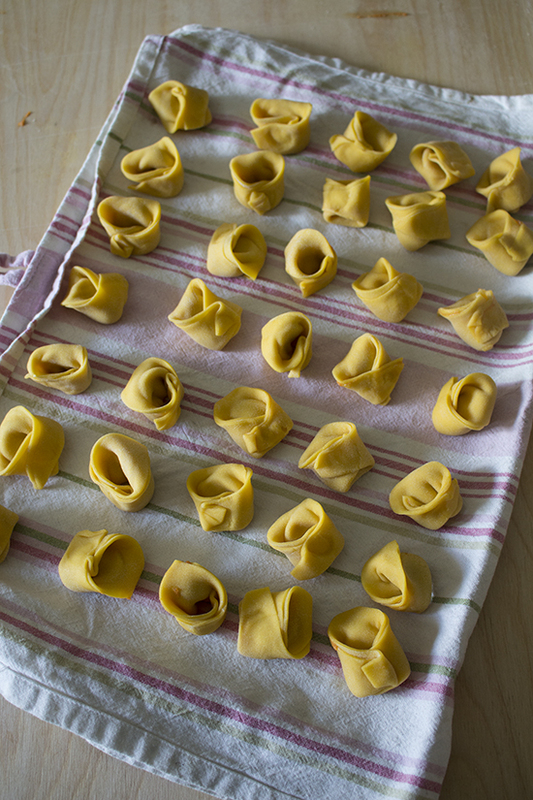 Allow the pasta shapes to dry at room temperature for about 30 minutes before cooking. For every 100g of pasta use 1 litre of water with 10g of salt. You’ll need a big pan, but it will be a great investment if you haven’t got one. Wait for the water to be really boiling before you put the pasta in. When you put fresh pasta in the pan, it will sink to the bottom. Shortly after, it will rise to the top. It will be cooked about two minutes after it’s risen. Do not be tempted to cook it any longer or it will be overcooked or scotto and nonna would definitely not approve. I love pasta all’uovo. I’ve recently inherited un torchio per la pasta. Have you ever used one Luca? It has a bench and bronze forms. I’m both excited and afraid to try it!